Covidien/Uni-Patch 12 Oz. Vitamin E TENS Lotion UP237N - was a green/white bottle when Uni-Patch. Covidien changed to blue/white bottle. 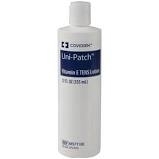 Covidien/Uni-Patch 12 Oz. + 2.00 oz. Bottles - Vitamin E TENS Lotion UP237N - was a green/white bottle when company was Uni-Patch. Covidien changed it to blue/white bottle.